The MacBook Air made its return last week, featuring a new Retina display, a Touch ID fingerprint sensor, and Apple’s T2 security chip in what the company called “the most secure boot process of any notebook.” It’s an interesting choice of words because when Apple introduced the iPad Pro shortly after, it called Face ID “more secure than any tablet or computer.” Presumably, that includes the super secure MacBook Air. It was a jarring moment. Apple went straight from boasting about the security of its new MacBook Air to declaring it outdated and weak compared to the comparatively priced iPad in the span of just a few minutes. So why isn’t Apple putting Face ID on the Mac? There’s any number of practical reasons why this could be the case. It might simply be a matter of size — Face ID’s array of sensors might be thicker or wider than Apple can fit in its laptop displays — or maybe Face ID would add costs. But given that comparable Windows laptops have managed to fit their own IR facial recognition cameras into their models, it seems like Apple could work something out. As it stands, the company’s latest and greatest MacBooks are not only behind its mobile devices — including the new iPhone XS and XR and iPad Pros — but they’re behind most Windows competitors as well. If Apple really wanted to make waves with the new MacBook Air, it should have taken a risk and added a notch. Hear me out. We’ve already seen other laptop makers shrink bezel sizes to the very limits of what’s possible, far beyond even Apple’s slimmest borders. Imagine a MacBook Air that, instead of playing catch-up to where the rest of Apple’s laptops were two years ago, jumped ahead of its competitors by cutting out almost the entire display, just like the iPhone X. If you think about it, a notch actually makes sense with macOS. We’ve seen Windows competitors like the Dell XPS 13 or Huawei MateBook X Pro awkwardly work around their webcam locations by hiding them at the bottom of the displays or even inside a keyboard key. (No one wants to see your nose hairs during a video call.) But a notched menu bar would let Apple keep the camera right where it belongs — in the top of the display — without sacrificing slim upper bezels. Combined with Apple’s already omnipresent-by-default menubar (which already has an awkward dead space in the middle in almost every setting) and the newly introduced dark mode in macOS Mojave, a notched MacBook would fit in perfectly to the existing software design, instead of being an awkward intrusion that you have to ignore like on iOS. 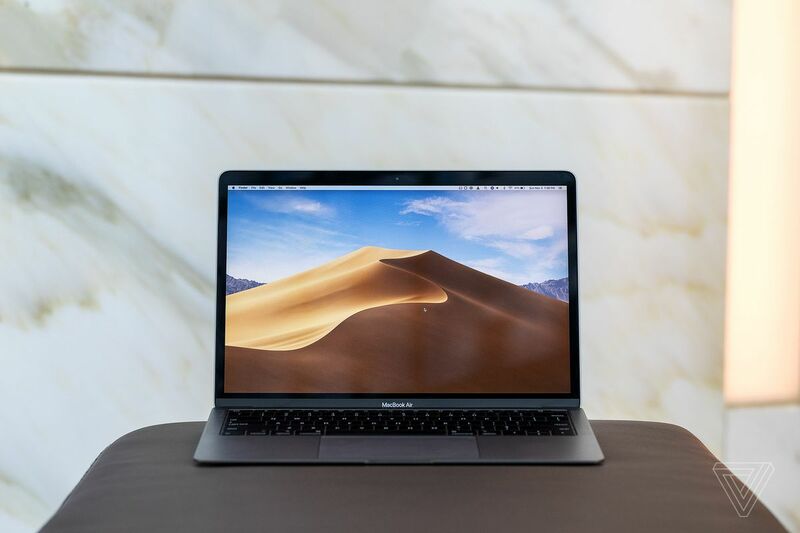 In an era where laptops all have started to blur together visually, a notch could set a next-gen MacBook apart from the pack. It’d be similar to Apple’s strategy with the iPhone X — at least until everyone copied it. If Face ID skips the Mac, it won’t be surprising. The Mac is just not a place where the company innovates anymore. Nearly every recent Apple hardware or software innovation started on the iPhone: the App Store, iMessage, Retina Displays, Siri, Touch ID, HomeKit, Face ID, touchscreen interfaces, and even basic UI trends. And the places where Apple is innovating on the Mac are sometimes based on Apple’s mobile operating systems — like the lukewarmly received Touch Bar, which was built off of a version of watchOS. Apple has eventually brought over almost all of these features to the Mac. But right now, Apple’s Mac lineup feels like an afterthought or a second fiddle that eventually benefits from trickled-down iOS features instead of its own platform for innovation. Now that it’s looking to bridge the gap next year with its Marzipan porting of iOS apps, that pressure from the mobile platform is only going to further cement that fact for Mac users. Apple is practically admitting that Mac apps aren’t enough anymore, and it’s turning to iOS. It’s not that Apple’s new MacBook Air is bad, per se: Apple made a perfectly serviceable refresh of the previous Air, but it’s an update that just brings things back up to par from the woefully outdated model. Taken together with the new Mac mini, you have two computers that weren’t updated for years that are finally getting brought up to the bare standard for 2018. Meanwhile, Apple continues to push to the cutting edge of its tablet technology year after year. It feels like Apple is excited about the iPad. It’s a place where the company wants to push the envelope of what’s possible with computers. And even if it seems like the software powering that hardware still isn’t quite ready for that future, at least Apple is trying to move ahead there, instead of playing catch-up from a self-imposed stagnation. It’s time for Apple to start pushing the MacBook line forward again — to take risks, to be bold, to be exciting. Perhaps, it could start with a notch.